A British football player plying their trade in a foreign league is a rare commodity these days and success stories for those who make the move abroad are even harder to come by. Very few British players and/or coaches are making a successful impact on football around the globe. The most obvious, modern day British expatriate would be David Beckham. Beckham possessed the talent, the attitude and the looks to dominate football across the globe, from lucrative sponsorship deals to a trophy cabinet laden with silverware, Beckham conquered almost everything. Other examples include Joe Cole at Lille as well as Carlo Ancelotti’s assistant coach, Paul Clement at Paris-Saint Germain. However, despite the perceived lack of success amongst the Brits abroad there are some success stories. 25-year-old Michael Mancienne has been quietly going about his business playing for Hamburg SV in the Bundesliga since signing from Chelsea in 2011. Mancienne began his career with Chelsea at a young age and during his teenage years he was marked as one of the more promising youngsters. Displacing the likes of John Terry or Ricardo Carvalho in the centre of a well established Chelsea defence would be a tough task indeed, especially for a youth player and with first team opportunities so limited; Mancienne cut his teeth out on loan. The young defender was initially loaned to Queens Park Rangers where he made a total of 58 appearances for the club over two seasons, between 2006 and 2008. Establishing himself as a key player for Rangers during his spell at the club, he showed his versatility across the defensive line by playing at both right back and centre back, winning the QPR Supporters Young Player of the Year award and securing a contract extension with parent club Chelsea. Mancienne then signed for Wolverhampton Wanderers on loan for the first three months of the 2008/2009 Championship season. The defender made an instant impression; making 8 appearances during his first, short spell as Wolves won the Championship title and promotion back to the Premier League. After his initial success, Mancienne returned to Wolves for their first campaign back in the Premier League where he made 22 appearances, scoring a total of 8 goals. Once again, he showed his versatility by moving into midfield and operating as a defensive anchor and contributing several goals as Wolves finished 15th, surviving relegation. Mancienne’s third spell with Wolves followed in the next campaign, but an injury blighted season limited him to 13 league appearances with the Midlands outfit. Despite enjoying a plethora of success at two separate clubs, first team opportunities at Chelsea very still limited. Having seen a total of five managers come and go during his fledgling career with The Blues; including the likes of Mourinho, Scolari, Hiddink and Ancelotti , the first team defence was all but set in stone. John Terry, David Luiz, Branislav Ivanovic, Alex and even Jeffrey Bruma were ahead of Mancienne in the pecking order under Ancelotti and at the age of 23 it was time for the Englishman to move on in the search of regular first team football. 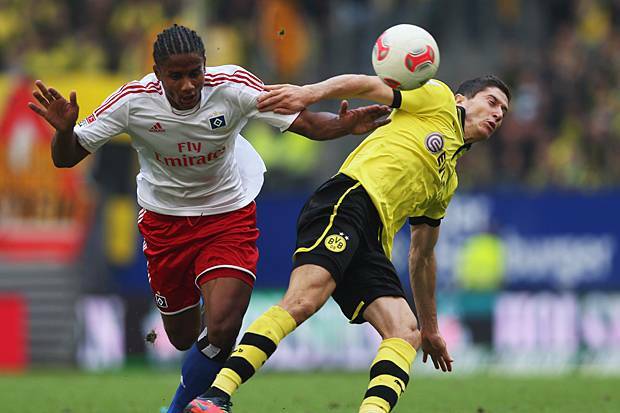 Mancienne’s mission for first team football took him to Hamburg SV in the Bundesliga. Former Chelsea Sporting Director, Frank Arnesen played a vital role in bringing Mancienne to Hamburg. When Arnesen took up a similar role at Hamburg, he brought with him several of Chelsea’s fringe players. Mancienne made the move to Germany for a nominal fee of around £2 million along with several team mates including Dutch centre back, Bruma who signed for PSV Eindhoven this summer. It was indeed a bold decision for Mancienne to move abroad, although he had attracted interest from a host of clubs in England the move to Hamburg has paid dividends. Mancienne risked falling into obscurity by not staying in England and that has largely been the case, especially with the Premier League-centric view of England and English players. “They’ve got so much money, and as a home-grown player you almost get cast aside a little bit. The move to Hamburg seemed like an obvious choice for Mancienne, providing the opportunity to broaden his football education. Following in the footsteps of the last Englishman to play for Hamburg, Kevin Keegan, Mancienne has adapted well to life in Germany. This season has been a particular highlight during his short career on the continent. During the 2012/2013 campaign he made a total of 21 Bundesliga appearances for Hamburg and, on average, he made 12 defensive actions each game and won 61% of his duels. Mancienne’s statistics compared to that of his centre back partner, Heiko Westermann, provide the perfect benchmark to judge how well he has performed this season. Westermann made 34 appearances (13 more than Mancienne), but also making the same average of 12 defensive actions per game and winning a total of 70% of his duels. Mancienne’s partnerhip with Westermann has greatly improved the Englishman’s game and had it not been for an ankle injury picked up in January, he would have finished the season with more game time under his belt and potentially with better end-of-season statistics to reflect that. He went on to compare the Bundesliga with the Premier League. “All the better teams in England try to play football, but every team in Germany plays football no matter what level they are. This is highlighted when you compare the pass accuracy of Mancienne with a Premier League player like David Luiz. Chelsea’s Brazilian, ball playing centre back finished last season with an average pass accuracy of 82%, where as Mancienne finished the season with an average of 86% for Hamburg. After a solid season with Hamburg there is no doubt that Mancienne has forced his way into the thoughts of England manager, Roy Hodgson. The transition of the England senior team has seen the same old faces rotated through the centre of defence with Phil Jagielka, Joleon Lescott, and Gary Cahill have all vying for the starting berth. They have also faced competition from younger players such as Phil Jones and Chris Smalling. The fact that Mancienne plays outside of the Premier League acts as both a gift and a curse for the defender. In one sense he has risked falling into obscurity but on the other hand, a player with the experience of football in a different league, in another country with a different culture gives him an advantage over his compatriots. We haven’t seen an England expatriate in the squad since David Beckham’s Real Madrid days and Mancienne would bring that continental aspect to the side. Something that has always been severely lacking in comparison with other European nations. Despite enjoying a relatively successful season for Hamburg, HSV boss, Thorsten Fink has opted to strengthen his options at centre back with the loan singing of Arsenal defender, Johan Djourou. The acquisition of the Swiss international has opened the door for Mancienne to leave the club with links already surfacing to teams in England, including Stoke City and Queens Park Rangers. No matter where Mancienne decides to play his football next season, his mission for first team football has been accomplished since leaving Chelsea and his development at Hamburg will stand him in good stead for the future. Another successful season for the 25-year-old will mean there is every chance he will be in contention to make the England squad. 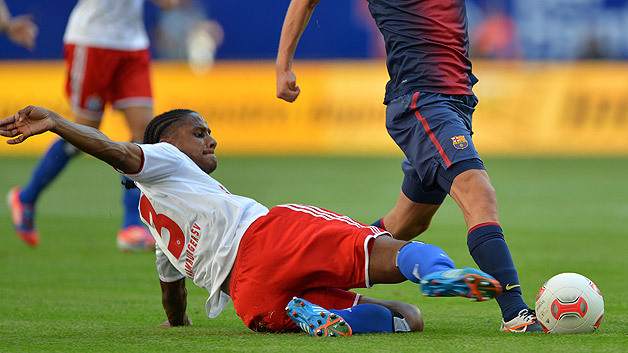 He will bring at least two years of valuable Bundesliga experience and could spring a surprise on many an England fan. This article has also appeared on these Football times. ← Too much, too young?